ATHENS, November 2 /TASS/. Russian Foreign Minister Sergey Lavrov will discuss Russia-EU relations and interaction in trade and economic spheres, investments as well as the power sector at negotiations with the Greek leadership, including Greek President Prokopis Pavlopoulos, Prime Minister Alexis Tsipras and Foreign Minister Nikos Kotzias. The purpose of Lavrov’s visit to Greece is to continue a political dialogue on a wide range of bilateral issues. The agenda includes urgent international issues and Russia’s current relations with the European Union. "Russia and Greece hold similar stances on many issues. Both countries stand for increasing the central role of the United Nations - the main universal structure for maintaining peace and security - in international relations," the Russian Foreign Ministry said. Russian-Greek relations are characterized Traditional friendship and affinity have always been characteristic of the Russian-Greek relations. "In recent years, our countries have stepped up contacts at various levels, including a dialogue at the level of the heads of state and government and the foreign ministers," the Russian Foreign Ministry went on to say. The foreign ministers in both countries regularly exchange views on urgent issues of bilateral relations as well as European and regional problems. The Russian and Greek foreign policy chiefs will sign a Plan of ministerial consultations for the years 2017-2019. The Russian-Greek trade turnover has seen a decline in value terms under the impact of negative external factors, including the anti-Russian sanctions and Russia’s counter-measures; as well as falling prices for fuel and energy. "According to the Russian Customs Service, the trade turnover decreased by 39.2% in 2014; 34% - in 2015 and 9.8% in January-July 2016 as against the same period last year," the Russian Foreign Ministry said. "At the same time, reciprocal trade is demonstrating growth in physical terms which stood at 13.2% in 2015," the ministry added. The Joint Russian-Greek Commission for Economic, Industrial and Scientific-Technological Cooperation plays the key role in setting priorities and coordinating trade and economic interaction. It will hold its 10th session in Athens on November 4, 2016. Russian tourists are returning to Greece. Tourism flows from Russia into Greece have increased by more than 20% over the same period in 2015. Sergey Lavrov and Nikos Kotzias will open the IV Russian-Greek Forum of Civil Societies and an exhibition of archive documents as part of the cross years of Russian and Greek culture. Lavrov will receive the title of honorary doctor of the University of Piraeus at an award ceremony on Wednesday. "An inter-church dialogue is a vital component of our relations that contributes to the rapprochement of the peoples of Russia and Greece," the Russian foreign ministry said. There is no doubt that Lavrov’s visit to Athens will further deepen fruitful Russian-Greek cooperation and mutual understanding in international issues. The Russia-EU relations will certainly be a separate topic for discussion. An internal crisis in Ukraine that grew into a conflict in the country’s southeastern Donbass region is one of the causes behind a strain in the Russia-EU relations. Kiev’s refusal to meet its commitment to fulfil the Minsk Accords is one of the main obstacles to the Donbass settlement. According to Russian Foreign Minister Sergey Lavrov, the Kiev government should cover its part of the route: to enshrine the Donbass special status in a law; carry out the constitutional reform and an amnesty and organize the local elections. 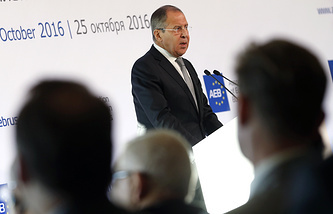 "We hope that our western partners in the ‘Normandy’ format will persuade the Ukrainian leadership to get down to business and stop staging a political farce," Lavrov said at a meeting of the Association of European Business (AEB). The European Union puts policy above economy. "Consequently, a review of relations with Russia which was carried out at the European Council session on October 20-21 revealed that the European Union remained unprepared for working out a pragmatic line towards our country that would meet (the EU) interests," the Russian Foreign Ministry said. At the same time, Lavrov said, far from everybody in the European Union is satisfied with the current state of things. "The political, business and public circles in many countries have become more active in expressing disagreement with the policy of sanctions and the public opinion is consolidating in favor of normalizing relations with Russia," the Russian foreign minister said. "Hopefully, the European Union will be able to overcome its ‘inert thinking’; will start defining its priorities independently without looking back at non-regional players and will fall out of step with the Russophobic minority inside the European Union," Lavrov concluded.